The Russian UFC fighter Khabib “The Eagle” Nurmagomedov continued his winning streak with a win over the “Notorious one” Conor McGregor. Khabib beat the 30-year-old Conor in a fourth-round by submission win in UFC 229 T-Mobile Arena. It was Conor’s first return to the octagon ring after he lost a boxing match with Floyd Mayweather. The last match of Conor in the UFC was on the 12th of November, 2016 when he won by a TKO against Eddie Alvarez. As for the Russian fighter Khabib, his last match was against Al Iaquinta on the 7th of April, 2018. This was the moment when Khabib Nurmagomedov won against Conor McGregor by submission. 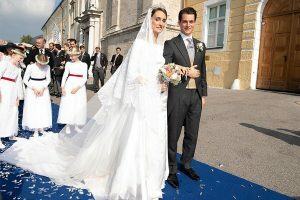 Photo Source: The SUN. 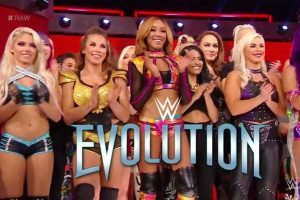 It wasn’t the ending what everyone had predicted. 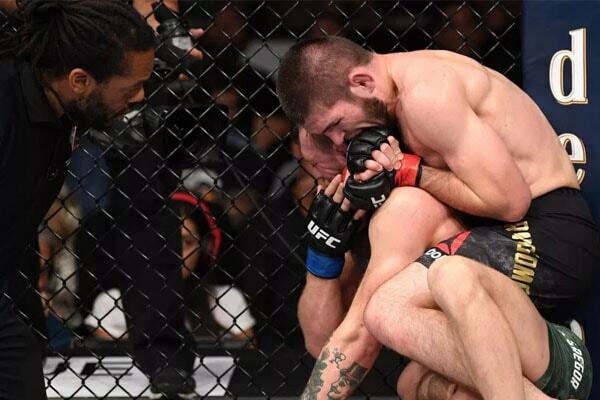 As soon as the fight was over, Khabib lept the Octagon and went towards Dillon Danis to ignite a fight. Dillon has been a big part of the Conor’s preparation as he was his jiu-jitsu coach. As everyone was focusing on Khabib’s riot against Dillon in the crowd, one of Khabib’s teammate climbed into the Octagon and sucker punched the recovering Conor. 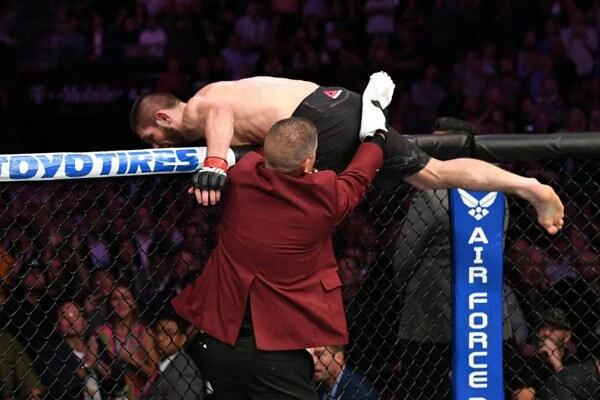 The moment when Khabib Nurmagomedov leaped out of the Octagon ring and attacked Conor’s jiu-jitsu coach Dillon Danis. 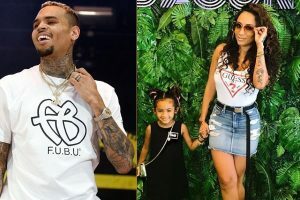 Image Source: The SUN. It was an unsportsmanlike behavior from Khabib after an otherwise impressive victory. Khabib had already warned that there would be no handshake after the fight plus there was no handshake before and during the fight too. Khabib successfully defended his Lightweight championship against Conor. But as the riot broke out, Dana White, the president of the UFC, didn’t give Khabib his belt. 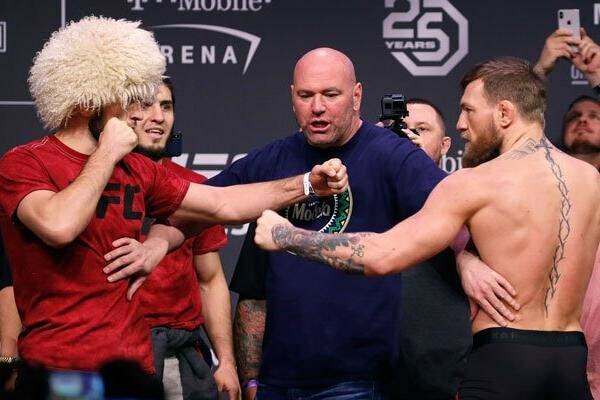 After the match, Dana stated that if he put the belt on Khabib, then everyone was going to start throwing stuff. Dana then decided to cancel the traditional post-fight ceremony. 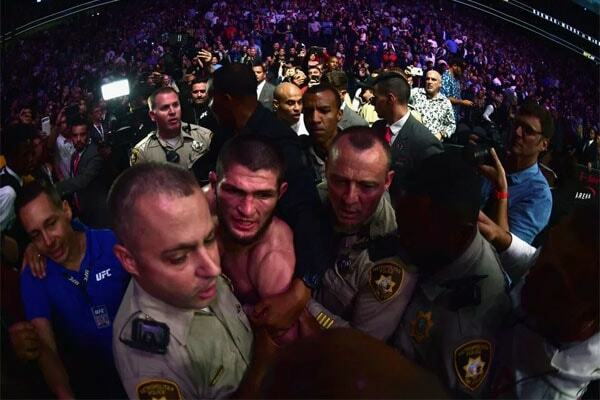 Rather than the belt, Khabib was escorted out of the ring being surrounded by a bunch of policemen and securities. The Lightweight Champion Khabib Nurmagomedovwas escorted out of the Octagon ring without his belt. 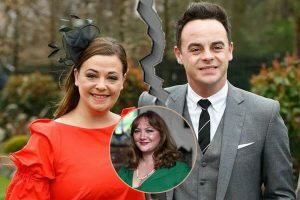 Photo Source: The SUN. According to Dana White, three members of Khabib were arrested and were in jail. But Conor McGregor refused to press charges against them. They all are free now but they will not make any appearance in the UFC since now. Khabib and Conor had a beef going on when Mcgregor had attacked the bus that was carrying Khabib and his fellow teammates. Who Will Take How Much? It was an unforgettable match and probably the biggest match in the UFC history. Now, most of the people will remember what happened after the match rather than what happened during the match. According to Khabib’s post-match interview, Putin called him and congratulated on his win. Plus Conor is a good friend of the Russian President Vladimir Putin too.